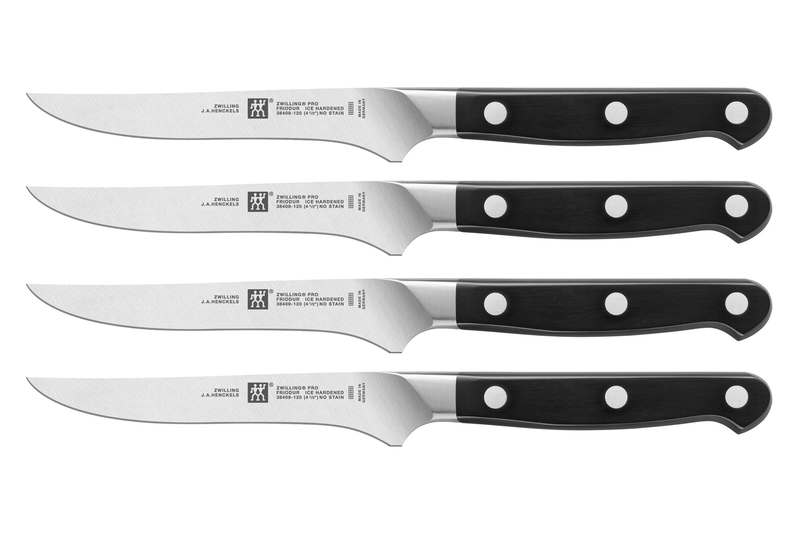 The Zwilling Pro steak knife set is designed to be easy to use and amazingly sharp. You will appreciate the sharpness and superb cutting control that comes from its unique wedge-shaped blade. The bolster, or base of the knife that separates your hand from the blade, is also angled to give you extra support, especially important when you're cutting lots of vegetables for soups, stews or stir frys. Pro knives are designed by Henckels in conjunction with architect, Matteo Thun. Every Henckels Pro knife comes with a lifetime guarantee and is made in Germany. 4, forged steak knives, each measuring 9 inches in total length. Each steak knife blade measures 4.5 inches long. Each handle measures 4.5 inches long. Rockwell hardness is 57, the higher the number the harder the blade. The harder the blade, the longer it will retain its sharp edge.